There’s a fascinating backstory about the building that is now the National Audiovisual Conservation Center, which is where the Library of Congress stores all 6.3 million pieces of the library’s movie, television, and sound collection. It used to be a nuclear bunker that stored $4 billion during the Cold War. Now, it’s a one-stop shop for all things regarding film preservation and restoration, with miles of shelves stacked with film reels to the ceilings, all sorts of machines that can repair film, process film, and print film, and any sort of video player you can imagine to play any sort of format that ever existed. It’s fun to take a tour of our country’s film archive, which includes the likes of Casablanca and whatever movie Adam Sandler made recently. They have it all. They even house nitrate film reels, which are extremely flammable because they’re essentially rolls of gunpowder. 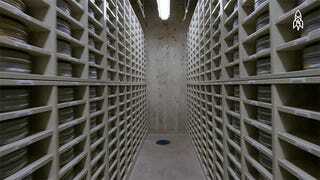 It’s no wonder that the nitrate vaults look more like a maximum security prison than a Blockbuster.